This is from the Autumn/Winter 2012 Collection. I have to admit this colour looked very strange on me after one coat and I almost reached for the polish remover! Luckily it improved greatly after I applied the second coat. In fact, I really like this colour now. I definitely don’t have anything like it in my stash. It’s very subtle and yet different. Now, if I ever become rich and famous – hey a girl can dream right? – OPI would probably make a colour just for me. Well, I don’t have to dream any longer. No, I’m not any richer and definitely not famous but this colour is so me, it’s untrue! The formula is so rich and perfect, this polish almost applies itself lol. This is two coats with Essie First Base and Essie Good To Go base and top coats. The colour is stunning and changes according to different light sources. Indoors it looks like a very dark purple with a gold tinge but in sunlight the gold seems to just pop out and demand attention. (You’ll have to just take my word on that, I live in the UK and the sun doesn’t stay out long enough for me to capture it with my camera). This polish is from the new Germany Collection from OPI for Autumn 2012. This is a vibrant, glossy, burnt orange – just perfect for Autumn! I’ve used it here with Essie First Base and Essie Good To Go base and top coats. This is two coats of Deutsche You Want Me Baby. I am still very busy and didn’t do a brilliant job of applying it but the polish did very well despite my clumsiness lol. It is extremely hard wearing, as you would expect from OPI. I’m very impressed with this polish. I absolutely love the colour and the formulation. I just hope the rest of the Germany collection is as impressive as I have most of them yet to try. This is “Fly With Me” from the “Take Wing” collection summer 2012 by Color Club. This is a stunning green. I’ve been wearing this polish for a few days and I’ve never. in my entire life, had so many positive comments on my nails!! Need I say any more? I love this polish. I’ve used it with Essie First Base and Essie Good To Go base and top coat. This is three coats of the colour, It did take a little longer than usual to dry but I can live with that. Not only is this polish extremely inexpensive and stunning to look at but it is also very durable. After several days there is still no sign of wear. Here is yet any stunning Nails Inc 3d polish. Hammersmith is a beautiful, glittery mix of blue and silver. Can you tell, I absolutely love this range of polishes from Nails Inc? When it comes to nail polish, I am instantly drawn to anything blue so Hammersmith was a definite “must have” for me! I adore the subtle shades of blue mixed with the silver. 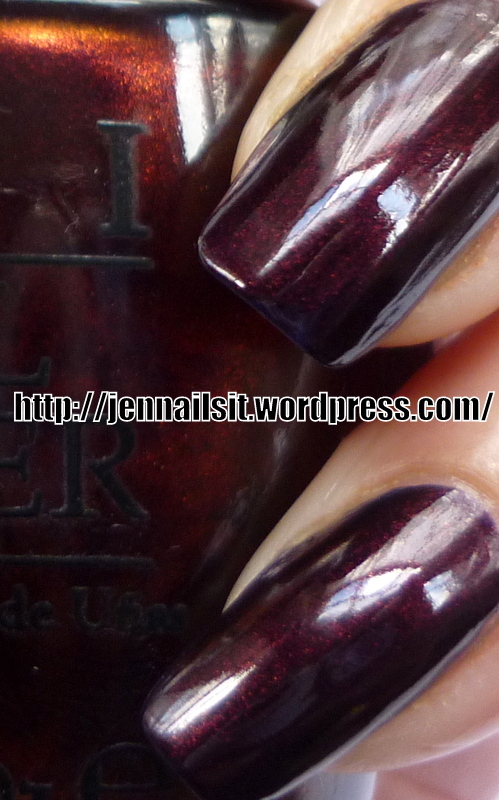 This is Vampsterdam from the Holland Collection by OPI. Now, this is the sort of colour I go for everytime. In fact, anything purple or blue and as dark as possible is always a “must have” for me. Vampsterdam is a very dark raisin colour. It doesn’t look right at all after one coat but this is it after two coats, it’s covered perfectly. I’ve used it with Essie First Base and Essie Good To Go base and top coats.